My family eat a lot of bread and this gives me the opportunity to experiment with a variety of recipes with the confidence that it won’t ever go wasted! This Pandan Chocolate Milk Loaf is the result of one of my experiments and it happens to be my Sister-in-Law’s favourite. I like this very much too as it looks attractive, the texture is soft and the aroma of pandan is just so delicious. In a sauce pan, combine flour and water. Mix with whisk or spatula until no lumps. Cook over medium-low heat, stirring consistently until the mixture becomes thicker. Once you see some lines appear, it is ready. Remove from heat and transfer to a clean bowl to let it cool. 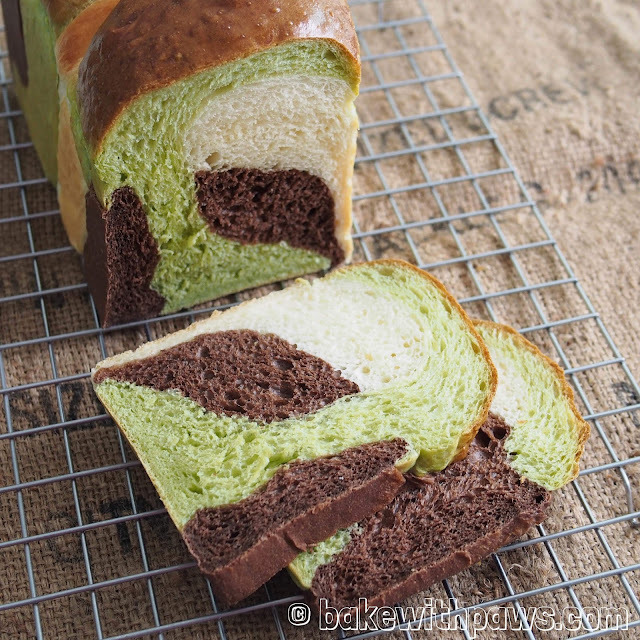 Line the loaf pan with parchment paper. 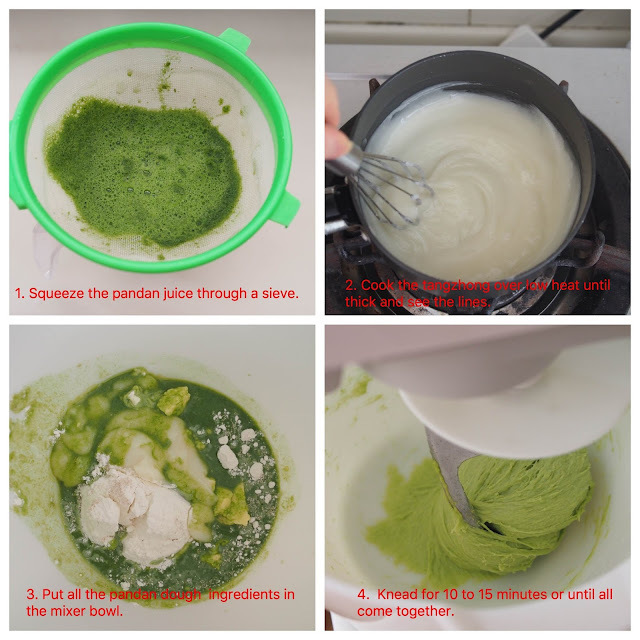 Pandan Dough: Add all ingredients (start with salt, flour, yeast, sugar, milk powder, butter, egg, pandan juice and one quarter of tangzhong) into the bowl of stand mixer. Using the dough hook on a stand mixer, knead until the dough comes together, become elastic and tacky but not sticky. Tacky dough behaves sort of like a Post-it note, sticking to a surface but peeling off easily. It takes around 12 - 15 minutes at medium speed. Let it rise in a warm place for 1 hour or until double in size in a large greased bowl, covered with cling film or kitchen towel. I normally leave the dough in the stand mixer’s bowl and cover with kitchen towel. 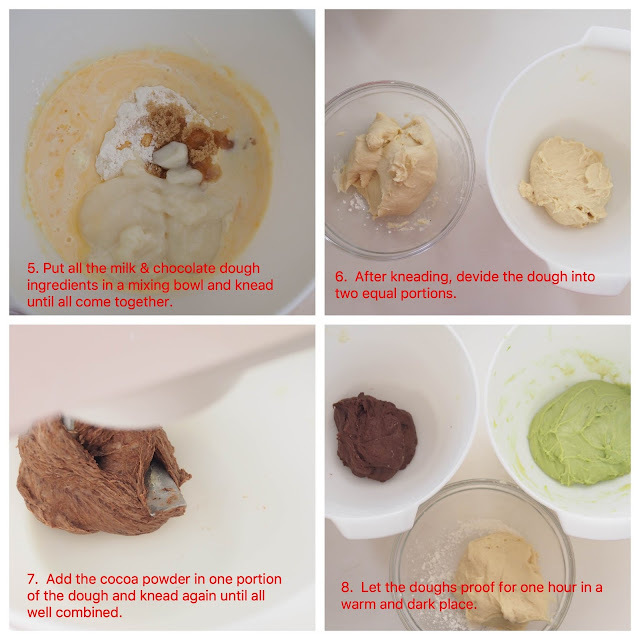 Chocolate Milk Dough: Repeat the same for chocolate milk dough ingredients except for cocoa powder. After kneading process complete, take out half portion of the dough and rest in a bowl. Add the cocoa powder in the mixing bowl with balance of the dough. Continue kneading until the cocoa powder well combined. Let them rise in a warm place for 1 hour or until double in size. 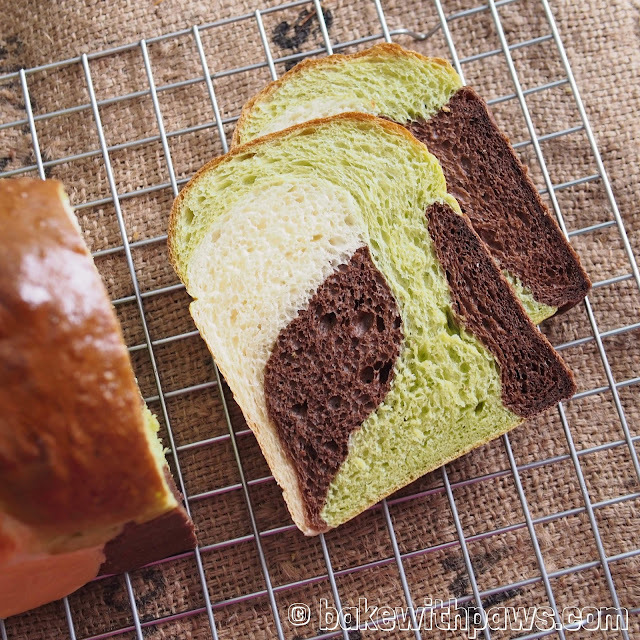 Punch down the pandan dough to release the air. Transfer the dough to a clean floured surface then form it into a strand (about 12 inch long). Repeat the same to chocolate and milk dough. 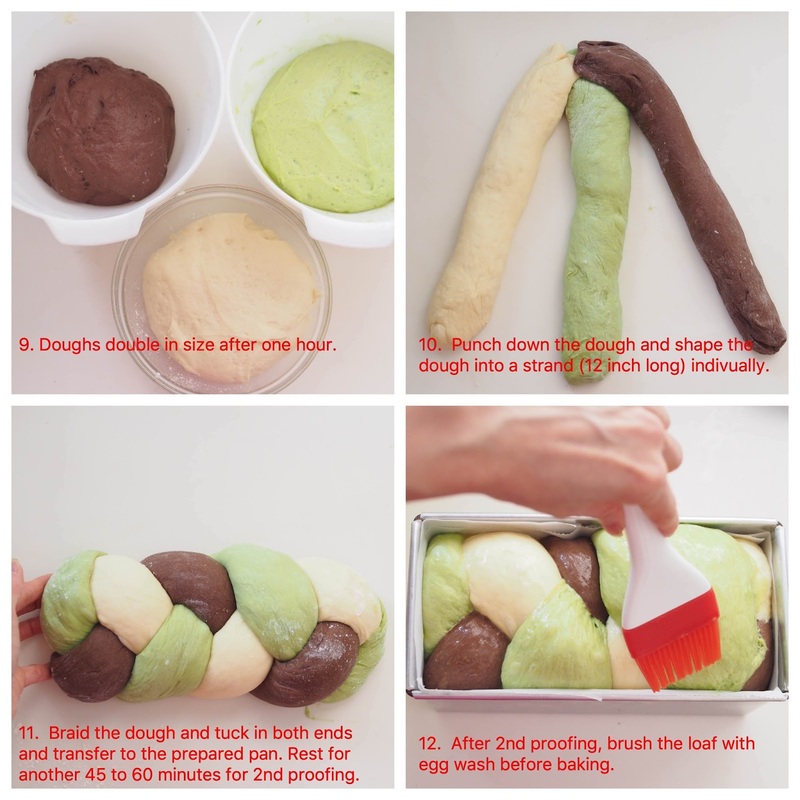 Braid them together and place the braided dough into the prepared baking pan. Let it proof for another 45 to 60 minutes or until double in size. Fifteen (15) minutes before baking, turn on the oven to 180C or 160C (fan forced). Bake in a preheated oven for about 30 minutes or until golden brown. Remove from the oven and transfer onto a wire rack to cool completely before slicing. Thank you for this plaited soft sweet loaf. Made it many times. Always a crowd pleaser with it’s pretty colours. Thank you for trying this recipe. I am so happy to hear this.